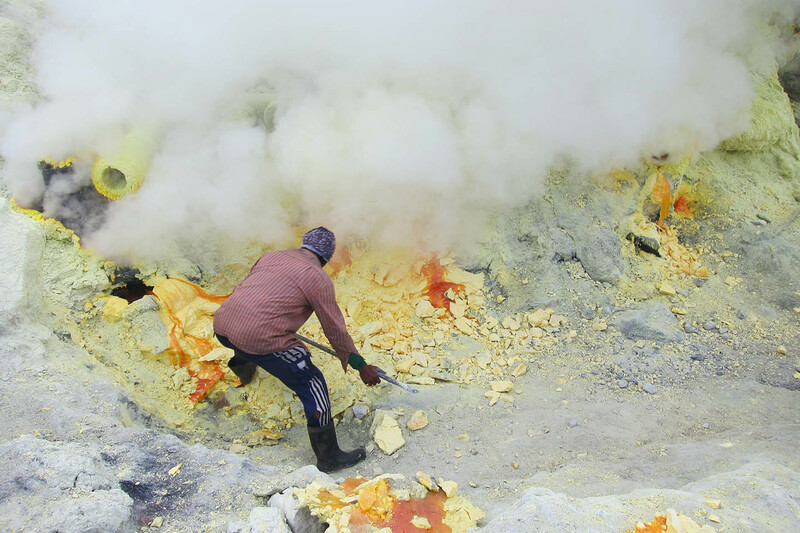 Mining for liquid sulfur at the Ijen Crater in Java is among the 10 hardest jobs in the world. 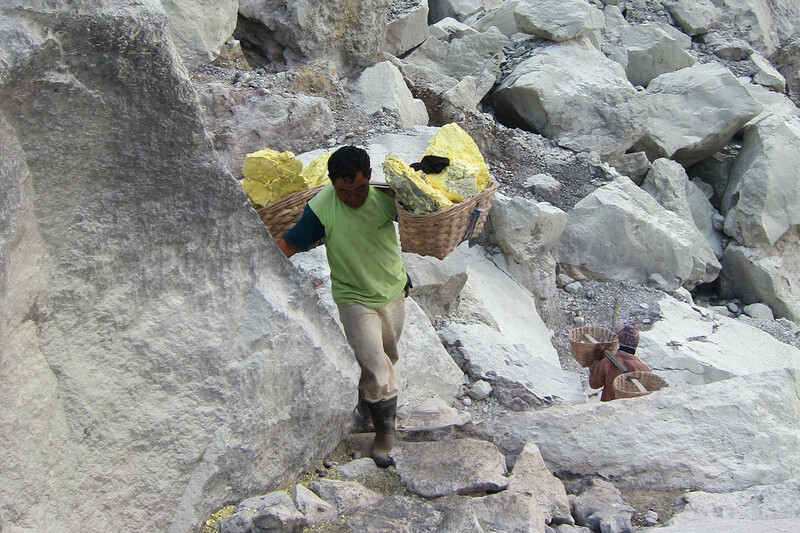 A single worker can carry up to 80kg of sulfur up and down a steep 3 hours track. Two loads will keep him 12 hours working a day making just enough money to feed his family. It's been an adventurous trip peppered with risky paths and toxic fumes but definitely one of the most impressing things we have ever done. 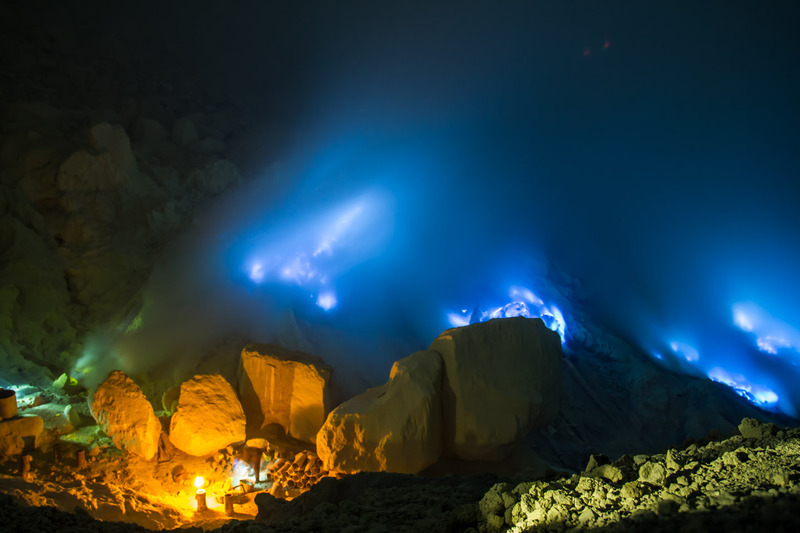 The Ijen volcano is located in East Java, Indonesia. 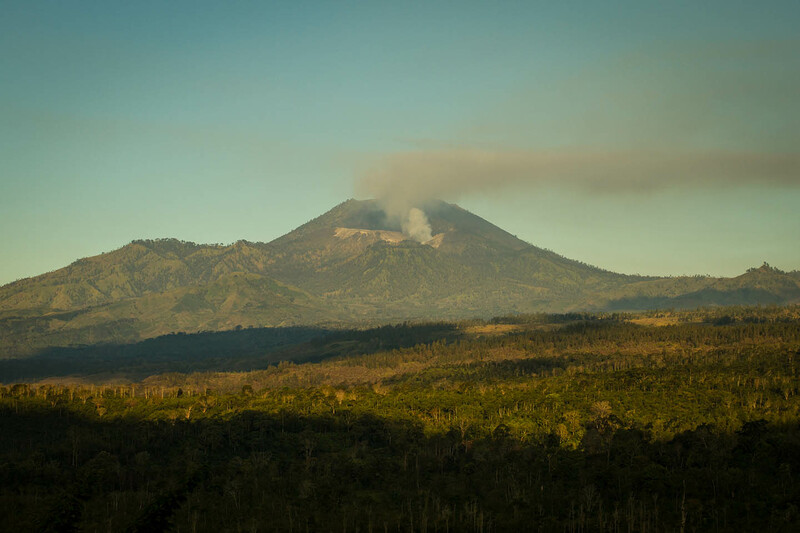 It belongs to a group of stratovolcanoes in the Banyuwangi Regency and once you are getting closer you can see the smoke rising from the crater. 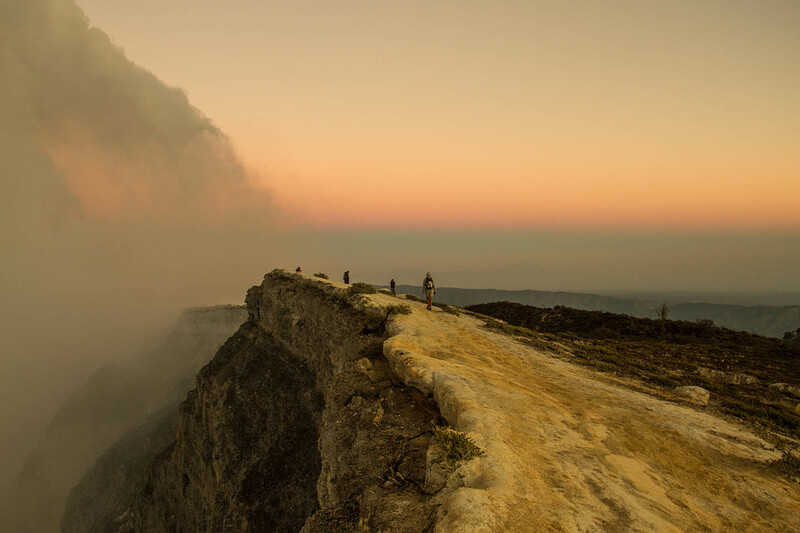 You can reach the crater either from central Java or from the coast towards Bali. There are some guided tours, but taking some care you go by yourself. From the Bali-Java ferry terminal it takes about 1 hour by car to get to the car park at the bottom of the mountain. Even if you are staying in Bali this makes up for a perfect day trip. 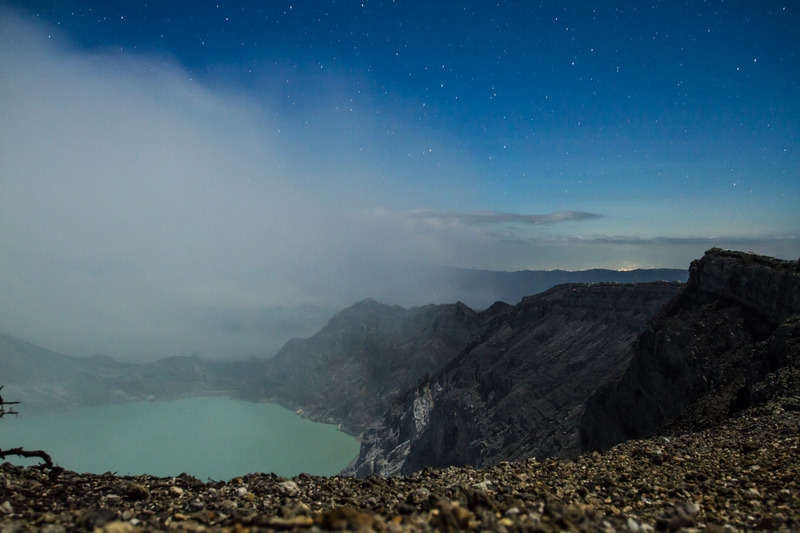 If you are planning to make a visit to the Ijen crater, you should really consider making it a night trip. The crater has some stunning blue flames at night that are worth the effort. We spent the night in a hotel about one hour from the crater, got up at midnight and started the climb around 1:00 am in the morning. The first part of the track is in good condition and you barley need your headlight when the moon is shinning. It is getting harder once you reached the top and start to climb down into the crater. You want to wear some decent shoes and have a strong light. If you get lost, just follow the workers who are already up using the cool hours before sunrise. It took us about 1 1/2 hours to get to the lip of the crater and another hour to climb down to the blue flames. Once you get there everything else is forgotten. This is really one of the most amazing things I have ever seen. It starts with a slight blue glow and ends up with big areas fully covered by blue flames. Watch out for the sulfur fumes that are hovering over this area. You might want to bring some cloth to cover your nose. We got hit by a big cloud of fumes and could hardly breath. In this case you should start to go back up and wait for the wind to turn. If you have some time left before sunrise you can climb back up to the crater lip, turn left and walk along the lip to get a nice view over the crater lake. In the morning the sulfur fumes tend to hover over the lake and make it almost invisible. Normally the clouds start to rise and dissolve at about 8:00 to 9:00 am, so if you want to go back into the crater it is advisable to let some time go by. There is plenty to discover around the crater. Walking a little further and taking a look into the opposite direction of the crater you might see Bali across the ocean. We brought some tea and food, made a fire and had a little breakfast. Finally we saw the sunrise over the mountains to the right. Once the sun is up most of the fumes tend to rise from the crater giving you a stunning view over the one kilometer wide, turquoise-colored crater lake. If you have enough power, it is worth going for another descent. The lake itself consists of strong acids so swimming is not advisable. Watch out for workers that might accompany your way down. Some of them are trying to make some extra money as a guide, but they never ask if you want to be guided in advance. One of them guided us back down and was asking for a huge sum of money. We ended up giving him 50.000 IDR which should be a fair deal for him. In daylight you can see the unbearable working conditions to its full degree. 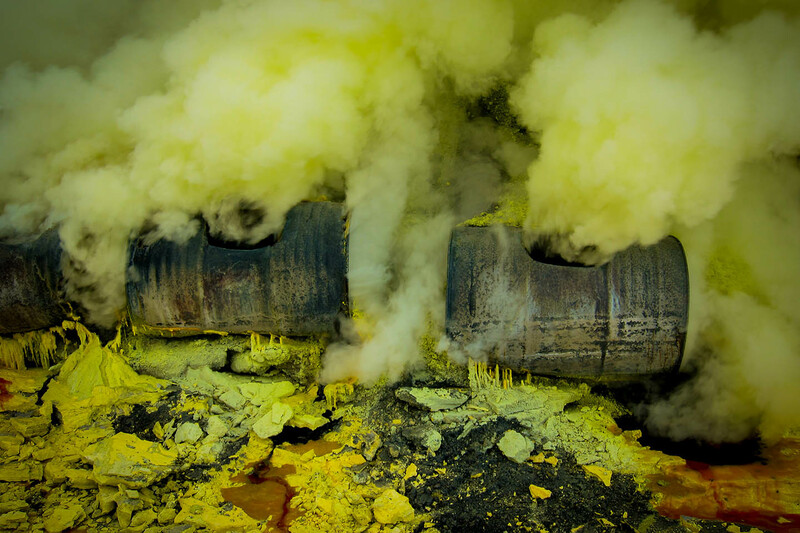 From the exit holes the sulfur runs through pipes and drums and spits out liquid onto the ground. There it cools down and becomes hard. The workers break it from the ground and load it into their baskets. The acidly fumes will hurt your throat and non of the workers do have a gas mask. Most of them suffer from serious health damages. It's a harsh working environment and demanding hard physical strength. Making their way back up to the crater lip and back down to the sulfur factory, each worker can carry up to 80kg. Each turn takes them about 6 hours and will earn a worker 5-8 USD according to the weight of his load. 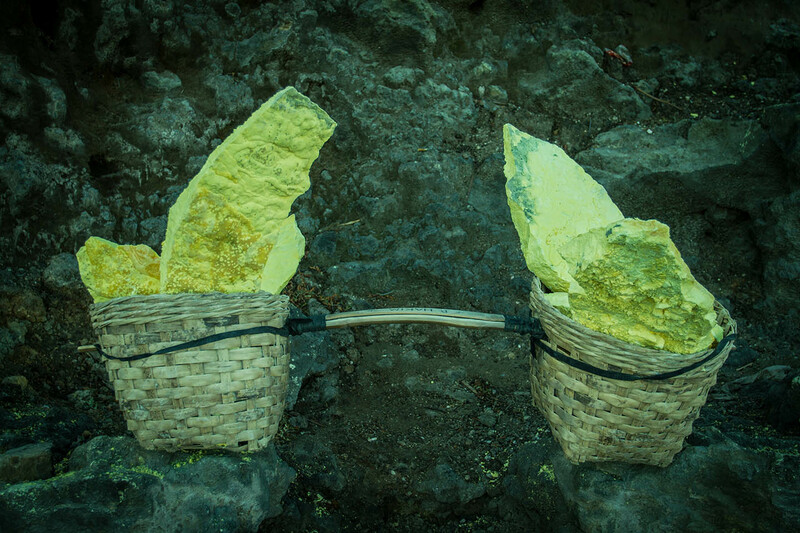 Some miners are selling small sulfur figures to tourists. They cost about 50.000 IDR which is about the equivalent of one turn and 5 hours of work. It's a good support and makes up a great souvenir. 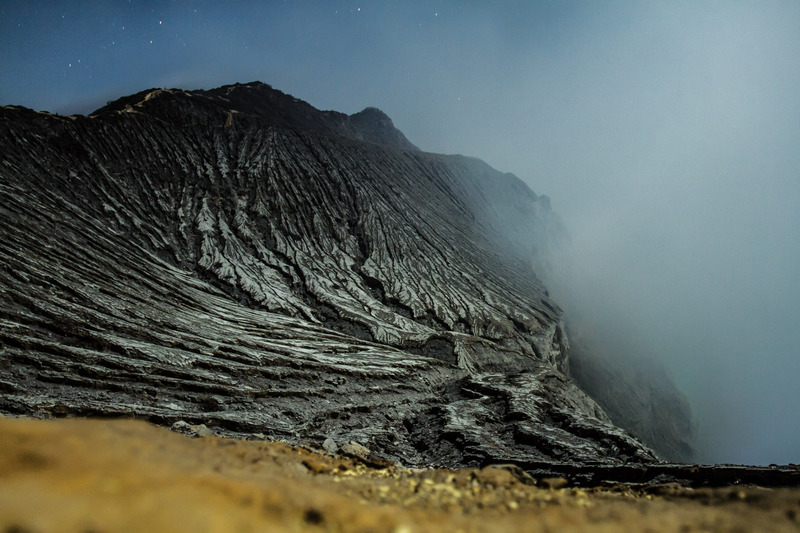 The Ijen crater is definitely one of the most amazing and shocking things we have seen so far. We tried to carry a sulfur load of only 75 kg and could hardly lift it a few inches from the ground. It is unbelievable and hard to understand how you can survive these working conditions for the time of your life and what it means to take up this burden day after day.